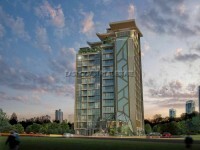 The Vision is Pratumnak hills newest completed High-rise. This Beautiful sea view located 11th floor 43.5 sq.m 1 bedroom, 1 bathroom layout, This condo is offered for sale fully furnished and fully air conditioned in each room. At the far end is a fully functional fitted kitchen with all built appliances. The building provides a 20th floor swimming pool, lounge, fitness centre, his/her saunas, 2 high speed elevators, electronic keycard entry, 24 hour security and CCTV.